Why Should I book a mover? For many people, the question if ‘Should I Book a mover?’ is asked on a regular basis. Often times people moving are looking to keep expenses down because they may be upgrading to a larger apartment or buying their first home. So it makes sense that people want to save some money when looking on how to move their belongings. Can I move myself? Sure many people are able to. But is it worth it? If you live in a small apartment on the ground floor and are moving just around the corner to another ground floor apartment and only have a few things, you likely do not need a professional mover. But think about what you are signing yourself (and probably your friends too!) up for here. Moving day can be a little stressful and there are things to remember. You will need to rent a uhaul or penske moving truck, you will need straps to secure your furniture, you will need blankets to wrap your furniture. You already spent all that time packing, do you really want to spend more time lifting up heavy furniture on and off a truck? It is very possible to do a smaller move yourself, but make sure you are ready for it! We have plenty of tips and tricks in our moving guide to help you be as efficient as possible. Keep in mind opportunity cost as well. Is the money you will spend on a mover worth your time? One scenario that we have seen plenty of times is people will start a move on their own only to realize how challenging it is mid way through. We more often than not will not be able to secure last minute rescue movers for you. So think long and hard! Ok so we discussed some of the challenges to doing a move without hiring professionals. So what are some other options. The next cheapest option is going to be hiring under the table movers from a website like Craigslist. There are legal ramifications to consider here which we will go into shortly. Aside from that, keep in mind that in moving, you pay for what you get. There is a reason under the table movers are cheap. They often do not carry a license or insurance, so they can pass some of their savings on overhead to the customer. They likely will have some older equipment and they likely will not have similar training programs as our movers go through. So if you are hiring from craigslist, please at least ask if they are licensed and insured. They probably will not cover you for damages either. Another option would be to rent a truck yourself then hire labor only services from a place like hireahelper.com. Now we are dealing with a few moving parts, and sometimes you need to hire two separate crews if you are moving a sizeable distance! So if those do not sound appealing, then what are the advantages of hiring a professional mover? 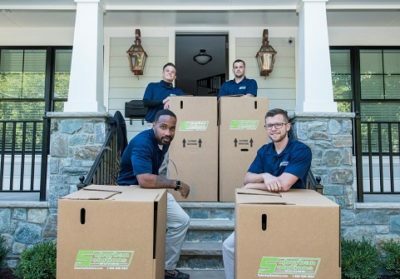 Trained Employees: we put our movers through a series of training sessions to ensure they are skilled to pack your kitchen, wrap your furniture for safe transit, pack a truck efficiently to maximize available space, carry large and heavy items, care for sensitive or fragile items. Uniformed Employees: We feel that by wearing a uniform every day, we show more pride in ourselves and in our work. We demand a lot from our movers, we want your moving experience to be enjoyable. So a clean cut crew with a uniform, personality and a smile is a must. If you don’t see that on your move, let us know! Reputation: We pride ourselves on our 5 star / A+ ratings. And everyone in the company, down to the newest of employees wants to keep our reputation going. It is a true sense of accomplishment. We want every one of our clients to have the best possible experience. At the end of they day, that is all that matters to us. So we go above and beyond any other company to ensure a positive moving experience! Why hire a moving company? The answer is simple. We will take care of every detail of your move for you! We can handle packing, moving, junk removal, cleaning and storage. We can even help with finding you contractors, insurance agents, realtors and other services for your current or new home. We have been around for a while and have worked with all kinds of companies that may be of help.